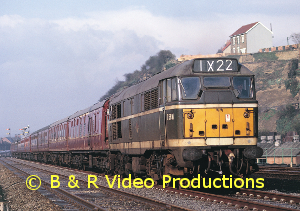 A sequel to Volume 9 which concentrates on the modern image of BR motive power. 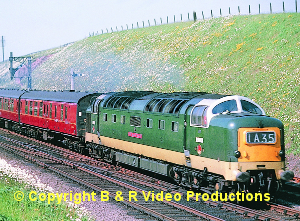 Most classes active on BR in 1985/6 are featured including a glimpse of the then new class 59 on proving trials piloted by 56047 on the spectacular Foster-Yeoman stone trains. We start with scenes at Wakefield Kirkgate, a mainly freight location at the centre of a number of lines and during weekdays enjoys a wealth of traffic; locos featured include 20s(triple-headed), 25s, 31s, 37s, 47s and 56s. 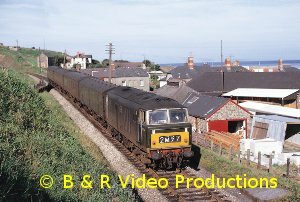 D200 is viewed at a number of locations on special runs including the “Tamar-Tyne Special” and the “Penzance Flyer” in 1985. On the WCML, Acton Bridge (north of Crewe) sees considerable activity on a weekday morning including 27066. Nearer Crewe, we see 97403 (46035) and 97201 (24061) as well as APT, HST, 87, 86, 85, 81, 58 and 47 classes. Our next location is Severn Tunnel Junction with wintry conditions. A 56 waits with oil tanks for a London bound HST as 25259 struggles gamely with a huge freight. 37s include “British Steel Shelton” also DMUs, 45, 47 (47078 “Sir Daniel Gooch” in green), 56, 33, 31 as well as an 08 on the Silcock Express!. At Chinley North Junction, unusual views of 31s and 20s as well as 45s and double-headed 37s as the trains negotiate the crossings on to the triangle or speed through to Manchester. We see a couple more double-headers at Chapel-en-le-Frith before moving to the dilapidated remains of Chinley Station where among others, 40057 powers through. Finally 40009/44 manoeuvring light engine in the yard at Warrington. Since 1955 Modernisation has eliminated steam locomotives from the system, prototype diesel and electric locomotives have come and gone as have most of the first generation of diesels. A few survive and today’s image although still changing has developed into a pattern which is illustrated by this video filmed during 1984 and 1985. The Westbury to Warminster line is the scene for the heavy Foster-Yeoman stone trains with Class 56s pulling and banking on occasions. 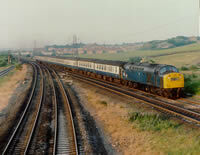 Other types include double-headed 37s, 45147 (pre-Eccles) and 47s. A day at Warrington, a very busy centre on the WCML, features classes 25,37,40,45,47 and 86. Toton and Worksop are hubs of freight operation and provide spectacular ballast and coal trains for dispersal throughout the Midlands. Class 31, 37, 47, 56 and 58 provide the power. 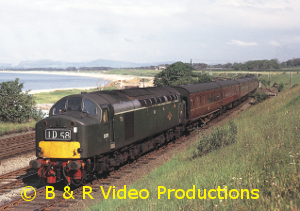 We move to Carlisle which sports a wide variety of diesel and electric power including APT, 26, 27 and 81 classes. A surprisingly busy part of the network with many cross-country workings is the West Country. Scenes from Tiverton, Exeter, Exminster, Starcross, Dawlish and Teignmouth. 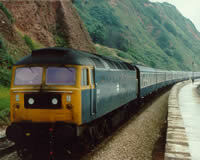 Locos include class 45s and 50s. At Retford and Worksop, more M.G.R. and coal traffic workings are seen at this extremely heavy worked location with 56s, 58s and 20s. 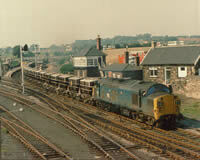 Finally Exminster and Truro are visited with passenger workings along this ex-GWR line.